In a multi-product business the sales volume variance can be separated into sales mix and quantity variances. The purpose of the sales mix and quantity variances is to show how much of the sales volume variance is due to a change in the mix of the products sold (sales mix variance) and how much is due to a change in the quantity of the products sold (sales quantity variance). The relationship between the sales mix and quantity variances and other sales variances is shown in the diagram below. Before discussing sales mix and quantity variances it is first necessary clarify what is meant by the term ‘actual sales volume at budgeted sales mix’ and to understand how it is calculated. The budgeted mix is simply the proportion by sales volume that each product represents of the total budgeted sales volume. For example if a business sells two products and budgets sales of product A of 9,000 units and product B of 3,000 then the budgeted sales mix percentage is calculated as follows. The business anticipates that its sales volume will be 75% product A and 25% product B. The actual sales volume at budgeted mix is now calculated by applying these percentages to the actual total sales volume of the products. For example, if the actual sales of the business are 10,000 units then the actual sales volume at budgeted sales mix is calculated as follows. At the budgeted mix the actual sales of each product should have been 7,500 product A and 2,500 product B. Of course the actual sales mix of each product will not agree to the budgeted sales mix calculations which gives rise to the sales mix and quantity variances. The sales mix variance shows how much of the sales volume variance was due to a difference between the actual sales mix and the budgeted sales mix. The variance is calculated by taking the difference between the actual sales volume and the actual sales volume at the budgeted mix and multiplying this by the budgeted price to give a monetary amount. The sales mix variance formula is as follows. It should be noted that the term standard is often used when referring to unit prices, so budgeted price in the above formula could be replaced with the term standard price. If actual volume is greater than the actual volume at budgeted mix the sales mix formula gives a positive result and the sales mix variance is a favorable variance. If actual volume is lower than actual volume at budgeted mix the formula will give a negative result and the sales mix variance is said to be unfavorable. The sales quantity variance shows how much of the sales volume variance was due to a difference between the actual volume sold at the budgeted mix and the budgeted volume. The variance is calculated by taking the difference between the actual sales volume at the budgeted mix and the budgeted sales volume and multiplying this by the budgeted price to give a monetary amount. The sales quantity variance formula is as follows. If the actual volume at budgeted mix is greater than the budgeted volume the sales quantity variance formula gives a positive result and the sales quantity variance is a favorable variance. If actual volume at budgeted sales mix is lower than budgeted volume the formula will give a negative result and the sales quantity variance is said to be unfavorable. The sales volume variance is based on the difference between the actual volume of sales and the budgeted volume of sales multiplied by the budgeted unit price. Where A is the actual sales volume, B is the budgeted sales volume and BP is the budgeted unit price. Using this sales volume variance formula we can now show that the sales volume variance is equal to the sum of the sales mix and quantity variances. If the term actual sales at budgeted mix (ABM) as discussed above is added and subtracted from this formula we get the following. The sales volume variance is the sum of the sales mix and quantity variances. A business provides the following information relating to its sales. The budgeted sales mix percentages are calculated using the budgeted sales information as follows. The actual sales are 11,200 units. The actual sales at the budgeted mix are calculated as follows. Note that this differs from the actual sales mix of 8,800 units of product A and 2,400 units of product B. The sales mix variance is calculated as follows. Sales mix variance = (Actual volume - Actual volume at budgeted mix) x Budgeted price. The calculations simply show that the sales of product A were 960 higher than anticipated by the budgeted mix and the sales of product B were 960 lower than anticipated. Since product A sells at a lower price than Product B the sales mix variance is negative and is therefore an unfavorable variance. The sales quantity variance is calculated as follows. 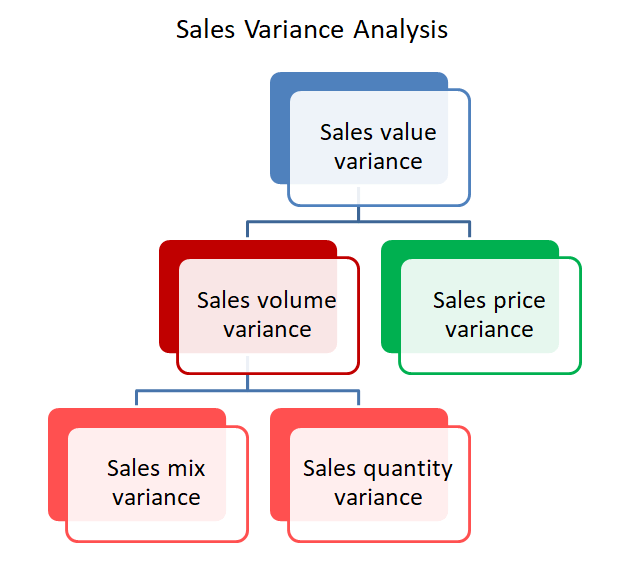 The sales quantity variance formula shows that the variance is positive and therefore a favorable variance. The actual sales at budgeted mix of product A were 840 units higher than budget and the actual sales at budgeted mix for product B were 360 units higher than budget. As we have seen, the total sales volume variance should equal the sum of the sales mix and quantity variances. Using the sales volume variance formula. The above analysis uses the budgeted price per unit of the product to calculate the monetary value of the sales mix and quantity variances. As an alternative for absorption costing the budgeted profit per unit or for marginal costing the budgeted contribution per unit can be substituted for the budgeted price in the above formulas.